Then as the English asparagus season continues, the recipes become more varied and asparagus makes an appearance in all kinds of meals. We tend to eat as much of it as we possibly can this time of year. 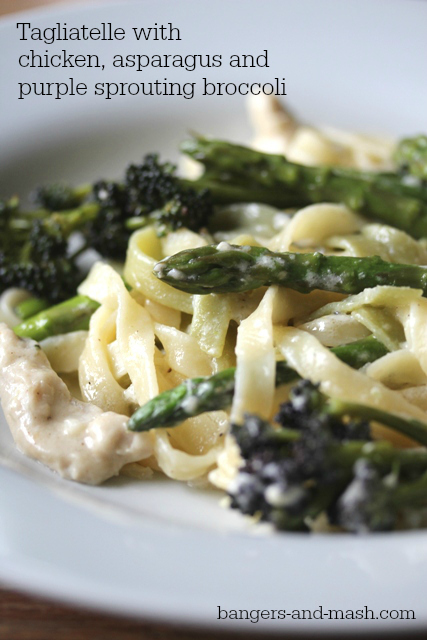 This easy pasta dish, which sees the asparagus partnered with tender stems of purple sprouting broccoli, also at its best in late spring, is a firm family favourite. I made it one evening last week when the children got home from school. The girls asked if they could bring a friend back with them, a friend who in the past has been a little on the fussy side when she’s come over for tea, so I usually play safe and cook something like fish fingers. But I had my heart set on asparagus that evening, and nothing was going to change my plans. Their friend had never eaten asparagus before, so I was intrigued to see what she’d make of it. Thankfully she seemed to enjoy it as much as my own girls and even had seconds. Hurrah! I’m always so pleased when other people’s children eat my food! I used some wonderful Sicilian olive oil from Pomora in this pasta, for frying the chicken and also a little drizzled over the finished dish. Through Pomora you can adopt your very own olive tree (or give it to someone as a gift). As well as receiving quarterly deliveries of delicious olive oil from your tree, you also get an adoption certificate and updates from the farmer throughout the year. The guys at Pomora have travelled across Italy and Sicily to find the very finest olive farmers. They all use sustainable farming methods, pressing their own olives in the traditional way under strictly controlled conditions. The olive oil is then shipped directly to customers, no middle men involved at all. 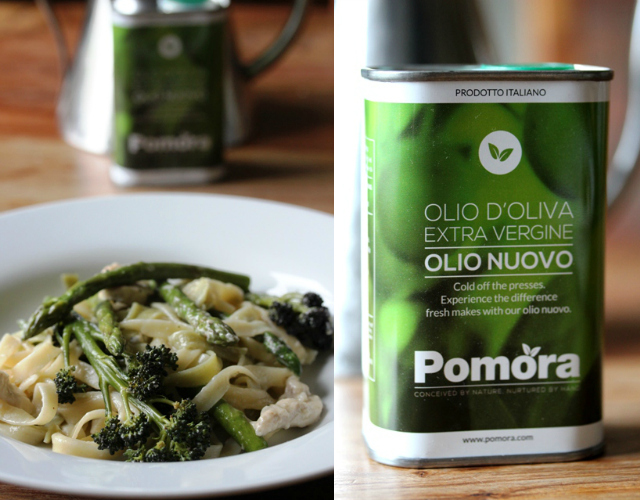 I was seriously impressed with the olio nuovo I received from Pomora to try out. This is their youngest, freshest oil, bottle directly after harvest. It’s unfiltered, giving it a gloriously vibrant green colour, and a delicious fresh flavour with a hint of pepperiness. It’s perfect for drizzling over pasta dishes as a seasoning and simply dipping big hunks of bread into. Fry the chicken in the butter and olive oil until cooked through. Stir in the crème fraiche, lemon juice and Parmesan, and season to taste. Steam the asparagus and purple sprouting broccoli until just tender and, if you like, slice into more manageable pieces. Bring a large pan of salted water to the boil and cook the tagliatelle according to the packet instructions. When the pasta is cooked, combine with the chicken sauce and stir through the vegetables. Serve at once with a drizzle of extra virgin olive oil and a little more grated Parmesan. I am entering this springtime pasta dish into the latest Family Foodies challenge, which I co-host with Louisa from Eat Your Veg. 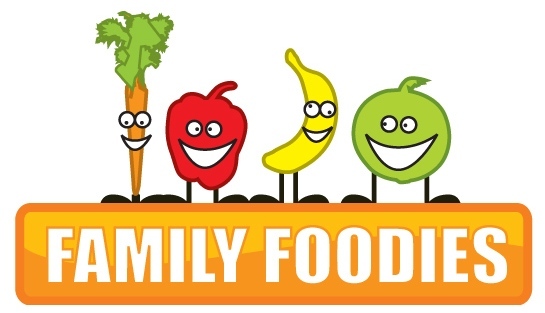 The current theme is Italian-inspired family food. Disclosure: Pomora provided me with complimentary olive oils for review purposes. No money exchanged hands and all opinions are my own (and my family’s). I’m adding in some garlic oil. Plz suggest! This is a great seasonal recipe! Sometimes I make something similar with mushrooms instead of chicken for a veggie version. Oh My Blog, I almost leaked the screen.